@lefthandseeds your my breeder & donor. We thank you for giving up your time, effort, and those hard earned seeds for this project to be accomplished, this is the start of it all! Thanks for setting this up! I love this strain. I think y'all are gonna love it too. Timeline Update: This strain will be a little bit extended. My tent will be occupied for a large pollen chuck with a yeti male against 4-5 other strains (I'm happy to share seeds from that run as well). So I'll kick this off probably sometime around January. If anyone is itching to get this in their hands sooner and do the F2 breeding work, my offer stands to be the donor. I'm going to start these seeds in 2-3 weeks. I'm bumping this up as my next grow. I have 9 Jungle Spice seeds. I'll germinate all of them, and open pollenate all, unless a few stand out as being worse than others. Bonus: I'm planning to run 2 more strains in my mini tent from some extra random seeds I've acquired. I'll keep one (best) female from each and cross it to the best Jungle Spice male. 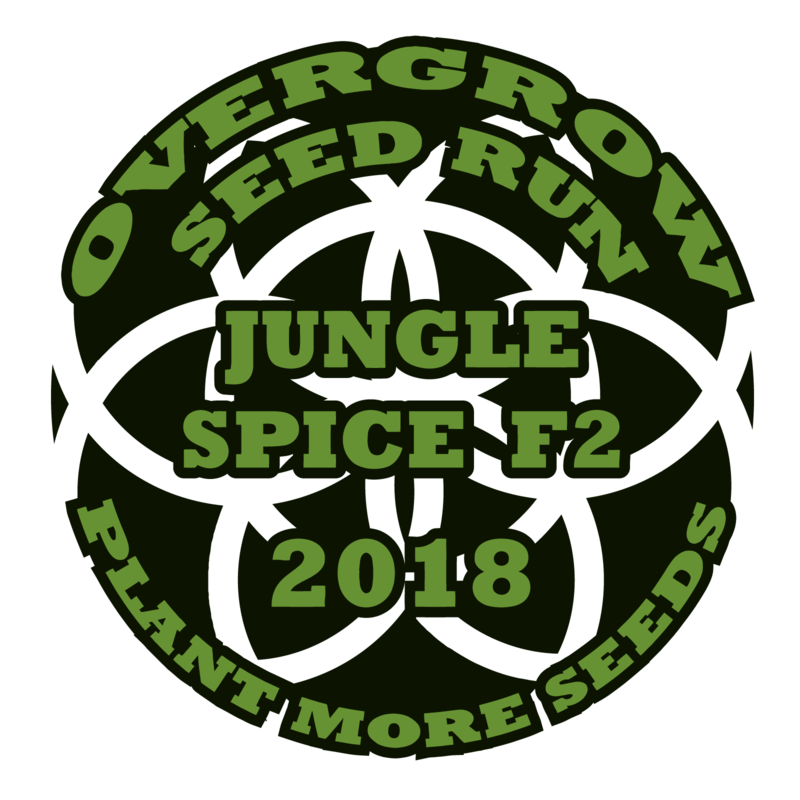 To go along with the Jungle Spice F2s. Get free seeds with every order of free seeds! Vote below! That could produce a lot of variation in F2 form... right? Usually on F2 we can have the highest expression of all the phenos. I started to run the numbers on the possible variability of a 4 male to 4 female cross, with each having a moderate variation in their "88 G13 x HP" gene donor and a very small variation in their "Congo Landrace" gene donor. For a "Congo Landrace x (88 G13 x HP)" crossed to "Congo Landrace x (88 G13 x HP)" you'd get up to 8 distinct phenotypes for 3 traits, except we're usually looking at half a dozen or more traits. Also, each parent will be slightly different, which means you could get seeds with 8+8+8+8+8+8+8+8+8+8+8+8+8+8+8+8=128 different phenotypes. As traits you're selecting for are added the numbers get exponentially higher. I believe that a better approach is to look at the solution from a larger view, because the raw numbers get so big. What will occur with a cross like this is a pooling of phenotypes as shown below. F3 filial crosses will have have a similar variability range to the F1 cross, and F4+ filial crosses will have less and less variability. 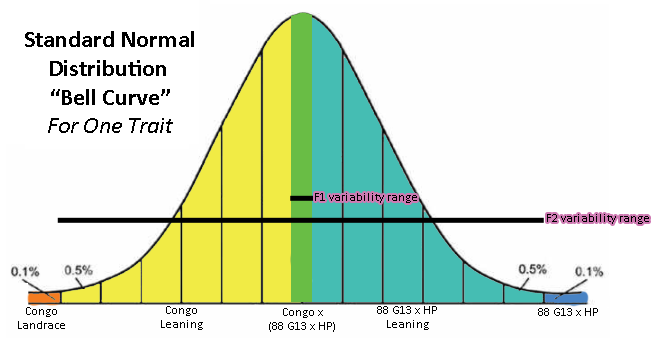 F2 will definitely have more variation. I think it really depends on what we're trying to do here. I could put more work into BX'ing off the pheno that I like the best, but then I feel like I'm really just giving out only one aspect of the strain (that suits my personal taste). At that point, I would be doing breeding for you instead of just crossing. IMO If I were on the receiving end of the seeds, I'd want to get the F2s. I have a very piney, uplifting and clear headed pheno in this F1 set that I like. If I have some F2s, I can do a little hunting for it. If I have BX, then if the breeder didn't select my pheno, I probably won't be seeing it again. My goal would be to F3 or mother the pheno I like from the F2 population. We can't hardly make F1s true to Bodhi's strains, so as I see it, them's the only options. Very nice/beautiful write up. Thanks. @lefthandseeds I LOOOVE piney strains and they seem to be uncommon, IMO. I LOOOVE piney strains and they seem to be uncommon, IMO. Then you'll want in on this one! I think I might bump this one up in my projects, and do it next. I'll update soon, but I might go ahead and get this started in 3-4 weeks. I'm getting close to starting seeds. I'm just waiting a few more days before throwing the beans in some water. I counted 9 seeds left. I don't have original packaging to show... didn't expect to be doing this! I'm thinking about running 2 strains in my mini tent, and passing those along as well as bonus seeds. I have some freebies and random seeds I've acquired I'd like to put to use. Only caveat is that my small tent is short, so I'm thinking indica leaners. Tajikistan or this menthol afghan! exactly what I was going to say, I'm always interested in heirlooms. The tajjikistan hashplant sounds particularly interesting. I added a poll above! Pick your faves, and I'll run two of them in my other tent and pollinate with the best Jungle Spice male. The refreshing and uplifting nature of menthol pine terps mixed with a body tingling sensation from the earthy hashy terps is just to much to pass up. I only hope we get a melding of terps! Yes and Yes. They're all interesting to me 'cept the OG Glue. 3/6 flowering plants chopped downstairs. Tent is starting to open up, so I'll be sprouting seeds soon! I'll keep one (best) female from each and cross it to the best Jungle Spice male. To go along with the Jungle Spice F2s. Get free seeds with every order of free seeds! Vote below! Naaaahhh!! You all know it! I AM DOWN FOR THIS! Update! I've chopped all of my current running plants, and they're drying in the tents. I'll be going live with this in 10-14 days. Stay tuned!